Hey everyone back again to https://joedichiara.wordpress.com with new artwork. 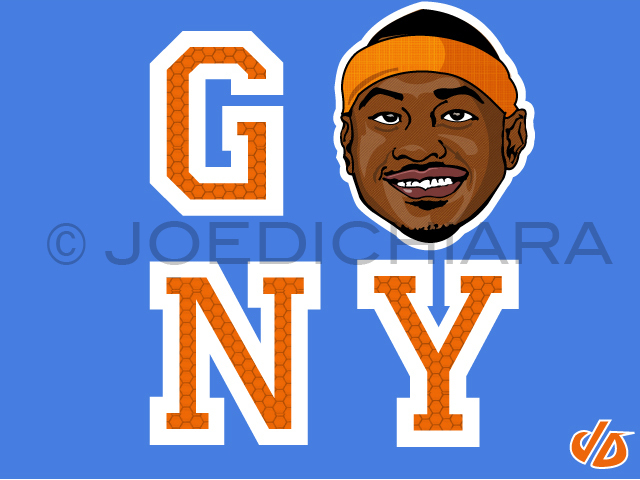 This week I am posting an illustration/design I did for new New York Knick Carmelo Anthony. As a Syracuse alumni I am very excited to see him playing once again in the state of New York. Here is the finished work, and be sure to check back to http:/joedichiara.wordpress.com and to log onto http://www.joedichiara.com for more art! Here is the video MSG played in anticipation of his debut with the Knickerbockers.